Earlier in 2017 we were approached by our customer to help solve a roof terrace design that required a tile finish but to allow for easy drainage onto a membrane roof. The customer had previously bought outdoor porcelain tiles 2 years before, to cover a membrane roof terrace of an area of 117 square metres. As drainage was a key factor in the design requirement, with a finished floor level that met the internal floor level of the building, using a traditional grout lay method of the tiles was not feasible. The solution found was using the Elite Outdoor Living Qwickbuild for Tile deck. This aluminium substructure can support the ceramic tiles, to enable a free-floating deck solution, without the need to disrupt the membrane roof system and incorporated drainage systems. The tiles 1200mm x 200mm in size where suitable for use with the Qwickbuild substructure, which was specially designed for this project. 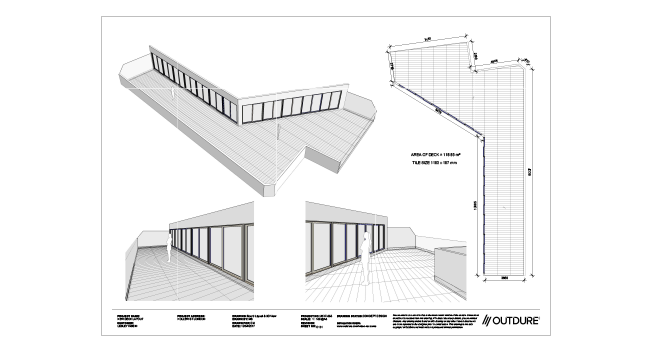 Following modelling the rooftop and incorporating the Qwickbuild and tiles into the concept design, we found that the CAD designs enabled us to secure the project and manufacture the Qwickbuild sub-structure for the project. The design allowed the outdoor finished floor level to be flush with the internal floor level. Any rainwater is free to drain under the deck freely into the pre-existing drainage system. This helps to prevent any water coming back into the building, while maintaining a flat finish deck level, over a sloping membrane roof system, an essential requirement on this project. This project is now ready to install which has been manufactured and supplied to the customer. We are now awaiting to see the final installed images of the job early in the New Year. Images of the deck area prior to installation and the production designs used to secure the work are attached to see how this concept was created.